Weekend Kits Blog: Felt Applique Christmas Kits - New for 2010! Felt Applique Christmas Kits - New for 2010! All new Felt Applique Christmas Kits for the 2010 holiday season are starting to arrive in the store. You won't want to miss these new felt Christmas kits from Bucilla. 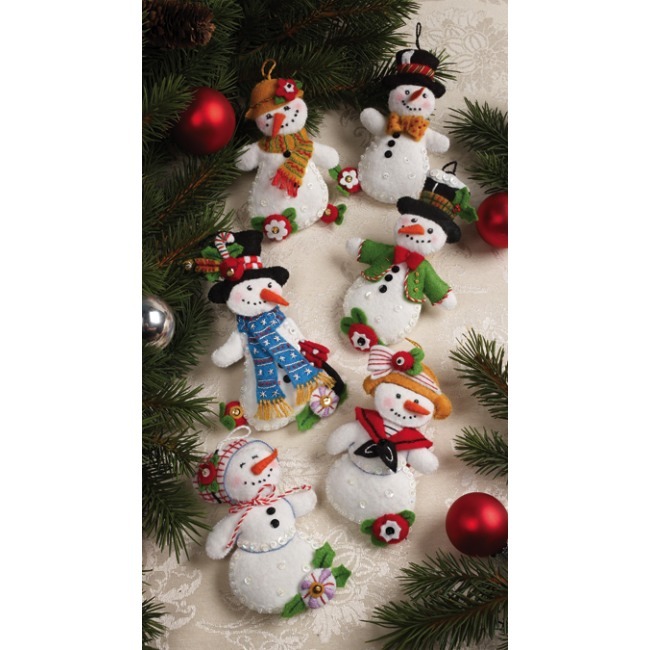 You'll find them in the Christmas & Holiday Kits section! 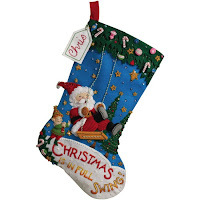 The Christmas Swing Felt Stocking Kit is a charming felt stocking kit designed by Mary Engelbreit. Featuring a sweet little elf pushing a cheerful Santa in the Christmas swing, this is one of my favorite felt stocking kits! Handmade felt stockings are an ideal gift to give your children or grandchildren. Your completed Christmas stocking will become a treasured keepsake for a loved one to enjoy every holiday season. Bucilla stocking kits includes stamped felts, cotton floss, sequins & beads, needles, and instructions. It's a good idea to get an early start on your felt applique projects for Christmas. Starting now means you'll be finished well before "Christmas is in Full Swing"! You can make these delightful felt applique ornaments with the Let It Snowman - Felt Christmas Ornaments Kit designed by Mary Engelbreit. Kit includes stamped felts, cotton floss, sequins & beads, needles, and instructions. You can see Mary's signature style shine through in each of the 6 unique felt snowman ornaments included in this kit. Finished ornaments are approx. 3-1/4" x 5". Felt Christmas ornaments are so fun to make and you'll find so many ways to deck the halls with your finished creations. Use to trim the Christmas tree, embellish a holiday wreath, decorate gift packages, and more! 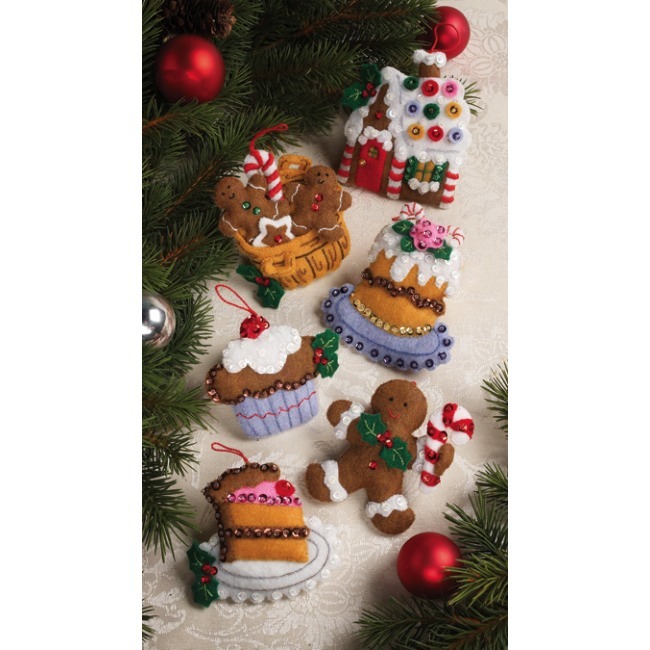 The Santa's Sweet Shop - Christmas Ornaments Kit features 6 unique & delectable felt ornaments, including a gingerbread house, gingerbread man, frosted cupcake, slice of cake, basket of cookies, and fancy iced dessert. This Bucilla felt ornament kit includes stamped felts, cotton floss, sequins & beads, needles, and instructions. Finished ornaments will be approx. 3-1/2" x 3-1/2". You'll need a pair of sharp precision craft scissors for cutting the stamped felt pieces. It's recommended to cut out the individual felt pieces as you need them, rather than cutting them all out in advance. You'll avoid losing small pieces and it will be easier to keep track of the numbers assigned to each of the felt pieces. Visit the Christmas & Holiday Kits section to see our complete selection of felt applique craft kits, including stocking kits, ornament kits, wall hanging kits, and more! Weekend Kits offers a unique selection of creative craft kits for Christmas and all year. Stop by today and be ready to start a felt applique craft kit on your next Weekend at Home! Thanks for visiting the Weekend Kits Blog. Complete Scrapbook Kits - Easy 8x8 Albums! Vintage Jewelry Making Kits - Get in the Groove!